SIGN UP NOW! EAT WELL ALL SEASON LONG! THIS IS NO ORDINARY BOX OF VEGETABLES. No middlemen, no warehouses. Everything in your box is grown by us here on our family farm on the East End of Long Island. It is harvested, washed and delivered to your neighborhood within 24 hours! Everything is 100% Certified Organic, grown with love and care. Have a question about how we grow your food? JUST ASK US, YOUR FARMER! We've been farming exclusively for CSA for the past 20 years. We don't have a busy retail location, we don't sell wholesale. We fell in love with farming and with the idea of growing beautiful, wholesome food for members of our community. Let us nourish you and your family this season and connect to the land that sustains us! THE FRESHEST PRODUCE AT THE BEST PRICE! Our mission from the very beginning has been to grow the highest quality produce for the best price. We believe that organic produce should be accessible to everyone, so we price our shares fairly, well below market value. Our full-season program runs for 25 weeks from June through November, which is the range of the local growing season here on Long Island. Members are invited to the farm in June for U-Pick Strawberries and Farm Tours. 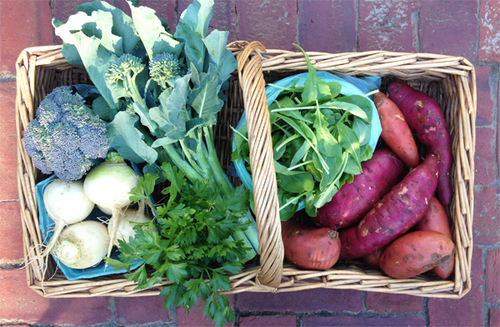 Tours are held throughout the season and we have a wonderful CSA Harvest Festival in October! Produce is picked fresh from our fields, washed, boxed up, and delivered to your PICK-UP LOCATION every week. We deliver to more than 50 pick-up sites throughout Nassau, Suffolk & Queens Counties. ❤ View SAMPLE CSA SHARES from past seasons. ❤ View our HARVEST SCHEDULE to see all the varieties we grow! ❤ Find a PICK-UP LOCATION near you! Come visit the farm and see how we grow your food! Join us for U-Pick Strawberries and Tours in June! LONG PICK-UP WINDOWS make it easier to find the time to pick up after work or after school. SIMPLE PRICING! We offer just one size share and one simple price which works out to just over $23 a week. This is a great deal for Certified Organic produce picked just hours before it is delivered to your neighborhood! This is one of the great benefits of joining a CSA. If you feel that one share is too much for you or your family, we encourage you to find a friend, neighbor or colleague who can split it with you. Our recommendation is for share partners to alternate picking up the full share every other week. 14 weeks of tree fruit (Apples, Pears & Peaches) from Briermere Farm in Riverhead. Click here for more information. Bi-weekly delivery of custom orders of grass-fed meat, dairy, beans, grains and other farm products from Upstate farms. Choose WHAT you want, HOW MUCH you want, and HOW OFTEN you order. I WANT TO JOIN THE CSA!